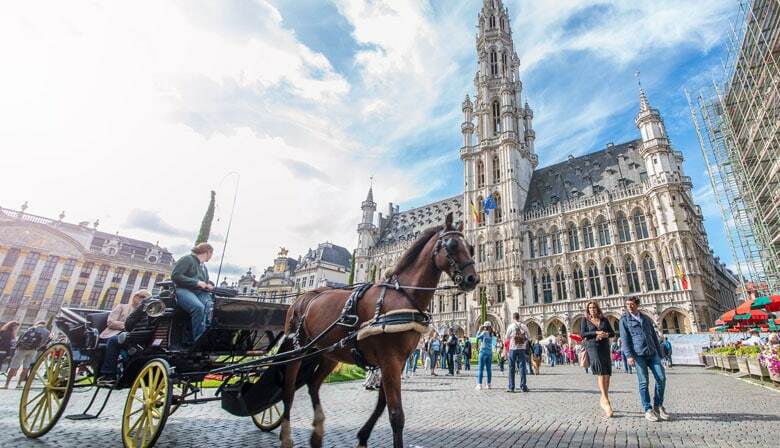 Take full advantage of your stay in Paris to discover Brussels. Take a comfortable, air-conditioned bus on a peaceful trip to see Belgium’s capital city at your own pace. You’ll head to the Paris Bercy bus terminal located in Paris’s 12th arrondissement. At the departure point, our representative will provide any information you might need to have a wonderful and peaceful day. You’ll then board a comfortable, air-conditioned bus, ready for departure at 8:00 a.m. Along the way, you’ll be greeted with views of the French countryside and free Wi-Fi will let you track your journey and surf the Web as you like. You will arrive in Brussels around noon, just in time to start the day with a tour of the city center. Brussels is not only the capital of Europe—it’s also a city with true architectural, culinary, and artistic wealth. During your stroll down picturesque streets, lanes, and through animated squares, you can admire the buildings whose façades evoke both art nouveau and comic books. Then, take a short break in a famous estaminet, the typical Belgian bistros located in the city center. With a Brussels Card, you can benefit from reduced prices in several restaurants listed in the guide we provide at the start of the tour. Don’t miss out on gastronomical specialties for which Brussels is renowned. Savor world-famous fries served with mussels or another dish from the Nazi resistance, then finish off with a delicious Belgian waffle, without forgetting to try a local beer. After your lunch, you can head out to discover the city, visiting Brussels’s many neighborhoods as you desire. The historical center is where most monuments and neighborhoods are located. Pass through the Grand-Place, with its ornateness placing it among the most beautiful central squares in the world. It has been classified as UNESCO world heritage since 1998. It is surrounded by the City Hall, which hearkens back to medieval architecture, and the Maison du Roi, the interior of which was completely renovated in 1985. South of the square, you'll find the city’s symbol, the celebrated Manneken Pis, a fountain in the form of a bronze statue representing a urinating child. A few steps away are the Saint Hubert Royal Galleries, among the oldest in Europe. Inside are dozens of shops and some of the world’s greatest chocolate makers. Following this, head to Delirium Café, which offers a selection of more than 2,000 beers. If you are passionate about comic books, be sure to take the comic book route. As the capital of comic books, Brussels has created an itinerary that includes murals on the city’s buildings depicting celebrated comic book characters. You can also see the comic book museum located in the same neighborhood.Although eccentric, the city’s royal neighborhood houses the Royal Palace of Brussels, a veritable art nouveau work of architectural art. Several feet from there is the Place du Grand Sablon, which is bustling on weekends, as antique and book markets sell their goods. If you'd like to explore the city further, you can walk to the Cinquantenaire, a park surrounded by the Museum of Armed Forces, the Air Museum, car museum, and the Cinquantenaire museum, which displays royal art and history. You can also head to the Atomium neighborhood, where a metallic structure has been constructed.With the Brussels Card, you can benefit from reduced prices on several monuments (including the Atomium or the Mini-Europe Park), excursions (such as the Beer and Chocolate Tour), as well as in souvenir stores, brasseries and restaurants. With it, you can take advantage of quite a few offers during your walk. Also included are free entries to the city’s various museums, on the topics of gastronomy, science and technology, and other aspects of traditional Belgian culture. You will be invited to meet at 5:45 pm (for a departure at 6.15pm) at the bus station to board your bus, which will take you back to Paris. You will arrive at Paris-Bercy around 10:30 p.m. The Brussels Card will be provided to you by our representative in Paris, accompanied by the list of places offering free entry or reduced prices. A VISA or passport might be necessary to enter Belgium. Speak with your country’s local authorities for more information. You will receive an exchange voucher, which you can present to our representative PARISCityVISION at the Bercy coach parking lot at 7:30 a.m.